The mighty CODE. alliance is mighty indeed. How mighty, you ask? Ah, if only there were killmails for tables. CODE. 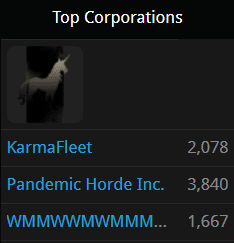 corporation WMMWWMWMMMWMWWMWMWMWWWMWMWMMWMWMWWMWMWMWMWMWMWMWMW was the #3 corporation in EVE this week, according to zKillboard. As a result, the corp got a place of honour on the front page of zKillboard--and promptly broke all the tables. For the first time in zKillboard's many years, the site was updated so that long, table-breaking names are now abbreviated. Talk about punching above your weight class. CODE. 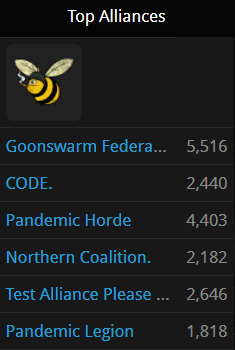 remains the most elite alliance in EVE. But you knew that already, unless you're one of those "CODE is still a thing?" types. In which case I would reply, "Yes, we're the thing that's currently putting your (considerably less elite) alliance to shame." 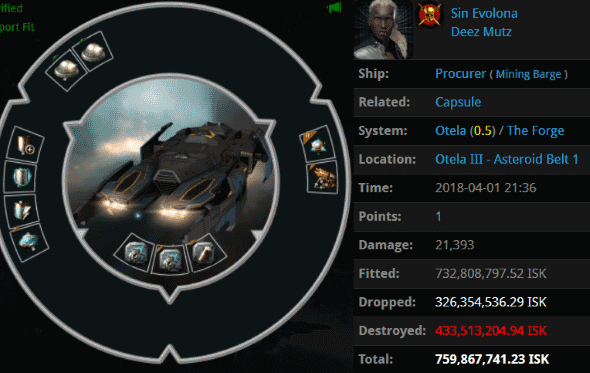 The return of the 'Aoede' Mining Laser Upgrade! 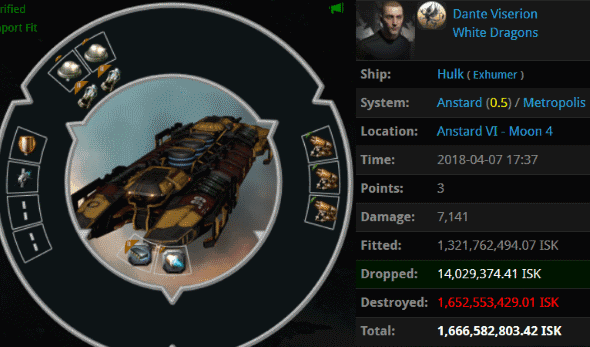 Dante Viserion lost a 1.6 billion isk Hulk without even having to fit ORE Strip Miners. He was ganked by Agents Ichabodi, Throatslashar, and iZaEaRl, but the fun didn't end there. 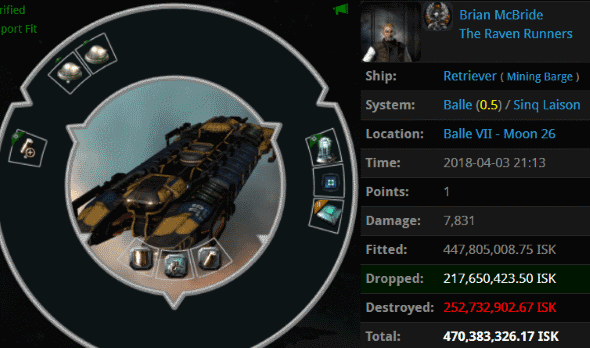 Dante's alt was killed in a simultaneous gank, so he also lost a 632 million isk Hulk. Hulk smash. It's amazing how much fail a miner can fit into such a small package. Brian McBride managed to lose 470 million isk on his Retriever. Agents Max August Zorn and Ernst Steinitz were fascinated by the bizarre specimen, which they promptly made extinct. Sin Evolona > is it parranoid or prepared to launch defence drones and lock wile mining??? Slutzilla > Defence drones are always important. Slutzilla > so keep your defence drones ready. How to explain Sin Evolona's grotesque Procurer--and all of these other mining monstrosities? Maybe the miners are learning that yield-fit mining ships are a bad idea in New Order territory, but they have no idea what to replace them with. Oddities have therefore been filling the vacuum. Agents D34dly D34dly, Slutzilla and Larsulrik Napsterbane removed one more strange ship from our fair highsec. Sin Evolona > any advice on a better fit?? Larsulrik Napsterbane > i'll write you a mail... probably you need better skills as well. Remember, miners: We're watching you. 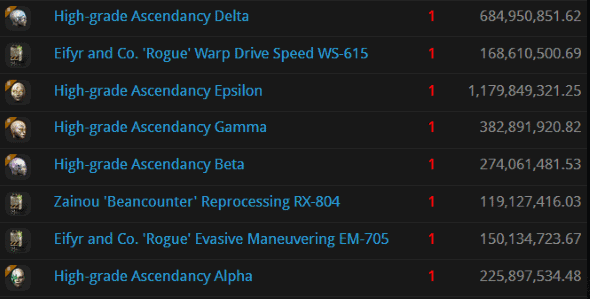 A truly awesome amount of carnage has been taking place lately--just ask the jump freighters, if you can find any. Dozens of them have been destroyed in the last several days. 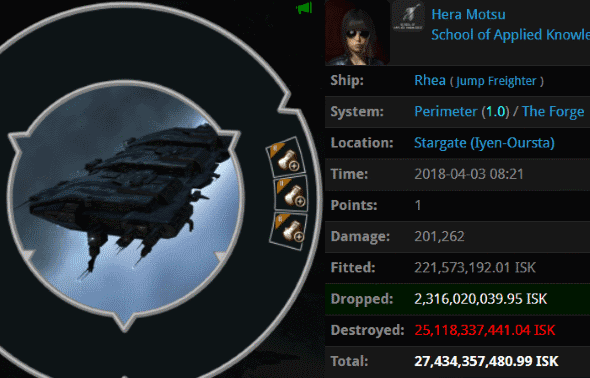 It's a year-round Burn Jita, brought to you by CODE. Hera Motsu became much better acquainted with the Talos hull when she was surrounded by a powerful execution squad consisting of Agents Australian Excellence, Dead Geen Whale, Tax Collector HongMei, Dead Purple Whale, Tax Collector Richard, Taxman Daniel, Tax Collector Larry, Tax Collector KarlMarx, Tax Collector Stroheim, Tax Collector AynRand, Dead Scarlet Whale, Tax Collector Hill, Dead Orange Whale, Dead Yellow Whale, Tax Collector Max, Dead Red Whale, Dead Brown Whale, Tax Collector BokChoy, Pod Destroyer Molly, Dead Pink Whale, Tax Collector Kittens, Tax Collector Aruka, Dead Gray Whale, Tax Tickler, Ektallion, and Kill The Innocents. Talos fleets aren't cheap, except in comparison to 27.4 billion isk jump freighters. SERJiLANT's 55.2 billion isk jump freighter is the kind of fuel that can keep Jita burning bright all night long. 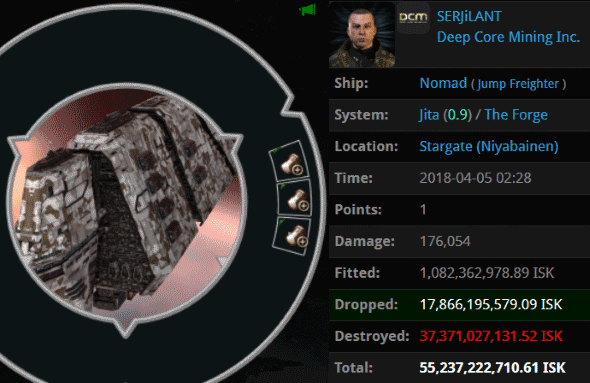 Carebears like SERJiLANT are happy to throw away tens of billions of isk, but they can't be bothered to buy a mining permit--or to take a minute to scout one jump ahead. Oh well, I'm sure this loss has "already been replaced". Agents thetermnater Orlenard, Tasia Schereau, Tarnia Podiene, patyooki, Tabitha Issier, Bailey Seyllin, Tateum en Thielles, Tarja Lemmont, Tasha Chastot, Amy Seyllin, Talli Rollard, brainlet, Talor Chanlin, Tauriel Allier, Taegyn Brinalle, Shy Elf Trap, Tarah Dorgiers, Taliyah Buelle, Tawni Heluene, Tawana Vaille, Becky Seyllin, Tatianna en Cedoulain, erobb, Daniel Chanline, Tami Riraille, Talula Agittain, Tanika en Cedoulain, Tamera Breau, James BIG BONED, HSM MasterChief PettyOfficer, HSM Fleet Admiral, Barbie Seyllin, and PogChampion showed once again that teamwork and strategy triumph over bot-aspirancy and isk every time. 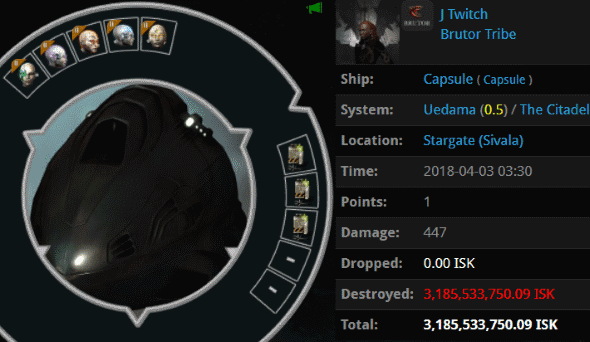 J Twitch sent her 3.1 billion isk Capsule into the wrong system. Actually, that might be giving Uedama unfair credit. If you're disobeying the Code, every system is the wrong system. Agent holdmybeer's smartbombs gave off a brilliant green glow and erased J Twitch's implants. J Twitch was always in a hurry to warp as quickly as she could. Our Agent forced her to stop and smell the Code. It's important to do that from time to time. "Remember, miners: We're watching you." wow just wow. ANOTHER week of failure from anti-ganking. just non-stop pure failure. Thanks to James for the blog and to all the Agents that help support EVE by killing the cancer that is carebearism.